The development of the railroad and the telegraph telephone industries are two of the most important movements during the Industrial Revolution, and while transportation and telecommunications has advanced since then its hard to forget the hard work and advances in industrial design and the legacy they leave behind. Railroadware™ a home décor brand repurposes steel and other industrial objects by making them into functional and beautiful statement pieces for your home. 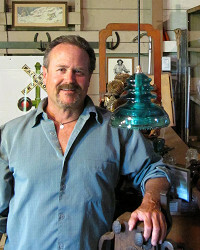 Railroadware’s designer Tim Leefeldt is an architect and has designed lighting & hardware for years. All of the common industrial artifacts he collects come from collectors and other sources and can be seen at any railroad crossing. Tim brings these common objects together and reintroduces them as artsy home decorative products, such as in the Insulator light. The Insulatorlight™ pendants are made from upcycled glass insulators no longer made. Each comes ready to hang with a black ceiling canopy, hardware, a 40 watt mini spot bulb and an adjustable 5' black cord. The light fixtures are made from all UL listed parts and are manufactured to meet NEC standards. Enjoy their old world charm as industrial artifacts and light up any room in your home. The development of the railroad and the telegraph telephone industries are two of the most important movements during the Industrial Revolution, and while transportation and telecommunications has advanced since then its hard to forget the hard work and advances in industrial design and the legacy they leave behind. Railroadware™ a home décor brand repurposes steel and other industrial objects by making them into functional and beautiful statement pieces for your home. Railroadware’s designer Tim Leefeldt is an architect and has designed lighting & hardware for years. All of the common industrial artifacts he collects come from collectors and other sources and can be seen at any railroad crossing. Tim brings these common objects together and reintroduces them as artsy home decorative products, such as in the Insulator light. 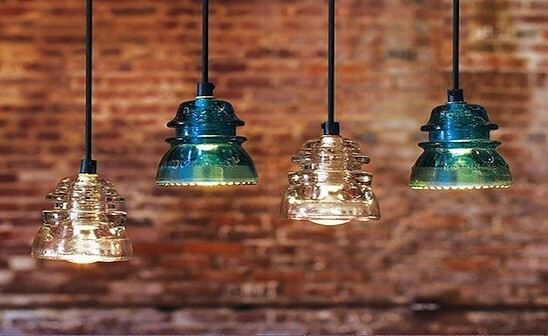 The Insulatorlight™ pendants are made from upcycled glass insulators no longer made. Each comes ready to hang with a black ceiling canopy, hardware, a 40 watt mini spot bulb and an adjustable 5' black cord. The light fixtures are made from all UL listed parts and are manufactured to meet NEC standards.